We decided to head straight into San Francisco rather than spending time exploring Monterey, which was a shame but given the limited time we felt that we wanted to spend it in San Francisco to get the most out of our stay there. The drive in was through mostly built up areas and along busy freeways, although luckily not as busy as LA. Giving the car up for a couple of days to the hotel valet parking in San Francisco felt like a welcome break, even though the driving had been easy it was nice not to have to find parking in the city and be free to explore on foot. After checking into the Hotel California (how apt!) our plan was to head down to Fisherman's Wharf. After a short stroll from the hotel along Geary Street to Union Square we started to queue for a cable car. For some reason I had in mind that Fisherman's Wharf would be downhill from Union Square and so unknowingly we started waiting for cable cars going in the wrong direction, to the terminus at Market Street and the shopping mall. But we were put right by an African American pulling a battered suitcase on wheels, who offered to show us where to stand to avoid the queues and who told us that Fisherman's Wharf was actually in the opposite direction to where we thought. A little nervously we followed him, wondering just what sort of scam we would be hit with, although in the crowded streets in daylight it seemed fairly safe. He was true to his word and got us on a cable car at a stop with only a few people. The 'sting' was merely to ask for a few dollars for some food. Mind you, from his expression I think he was looking for a little more than the few dollars we gave him. As well as being a tourist magnet, Fisherman's Wharf is full of colour and colourful characters. Amongst the tourist throng a scruffy guy, ostentatiously smoking a cigarette picked his way deliberately along the sidewalk as carefully as if he were treading a slippery narrow cliff-top path. Another drifter paused by Pier 39 with a trolley full of junk, an old mat perched on top, a bed for four dogs of varying sizes. 'Come on, let's find some shade'. 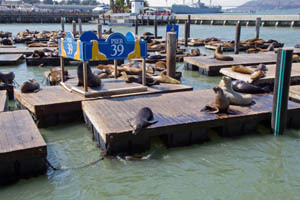 The sea lions at Pier 39 were audible and smell-able almost as soon as you stepped onto the pier from the road. But forgive them this and enjoy seeing them basking in the sun, playing and knocking each other off in their equivalent of arm wrestling, nudging each other off the floating pontoons with their muscular necks. A favourite way of getting our bearings in a new city is to take one of the open-top tour buses. Finding one at Fisherman's Wharf was easy and we were soon off on a 'Downtown Loop' with a local host who gave us snippets of the city's history along with numerous facts to make the trip interesting (see sidebar). The Tenderloin is a fascinating area. It was built on landfill and old wrecked ships and is a flat area in the otherwise hilly San Francisco. There are several stories of how the area got its name, all mostly derived from the fact that it harboured numerous Speakeasies, illicit drinking dens during Prohibition Era which required various bribes to the local police in order to avoid raids. The police became so well off with bribes that they were able to buy the better cuts of meat, especially tenderloin. However it got its name the area now is interesting and has a raw edge feel to it. For interesting, read - best viewed from a tour bus and definitely not a place to wander alone after dark. Walking around with a map and/or camera is bound to attract unwanted attention. Our first day's impression of the city was one of liking. It felt a friendly place and we could comprehend its scale, the downtown area on the peninsular being roughly shaped like your thumbnail and 7 miles square. Being from a large city ourselves we fully appreciated there were rough areas and no-go areas for tourists just as there are back home, so this didn't bother us. Yet it was sad to see the more obvious beggars; homeless people sleeping under coats on Union Square next to shoppers of Macy's, Neiman Marcus and Saks. Old Asian women with latex gloves going through bins looking for cans and bottles to collect return deposits for a living. There is a big contrast between rich and poor. It is like two worlds living in the same city, leading very different lives, ignoring each other. Back for the night at the Hotel California we planned the following day, the Golden Gate Bridge, Sausalito and maybe a final visit to Pier 39. We also read up on the Yosemite fire updates to see whether we could still keep to our plans. The Tioga Road across the Park was still closed and there was a threat o f smoke in Yosemite Valley. Tomorrow evening we would have to make a decision whether going to Merced for a trip into Yosemite Valley would be worthwhile. If not we faced a much longer route around the Sierras to rejoin our itinerary at Lone Pine. Joe DiMaggio and Marilyn Monroe, both divorced and therefore not able to marry in church, married in City Hall and had their pictures taken on the steps of Saint Peter & Saint Paul church in the North Beach area. In North Beach, Joe DiMaggio Park, in which the young boy played baseball now does not have a baseball diamond, only a tarmac basketball court. On the subject of parks, Washington Park, also in North Beach, is home to a statue - not of George Washington, but of Benjamin Franklin. Nearby Telegraph Hill is home to Parrot Park, which thankfully is appropriately named; it is home to some feral Amazonian parrots who roost here every night. The term 'Sugar Daddy' comes from the story of a mid 50s Adolph Spreckels millionaire owner of Spreckels Sugar Company marrying a mid 20s socialite, Alma de Bretteville much to the disapproval of the public. It was said she only married him for his money, hence the term 'Sugar Daddy' was born. Although Lombard Street is credited with being the crookedest street in San Francisco, Vermont Street in the industrial district of Potrero Hill actually has more switchbacks. San Francisco has the most number of Starbucks than any other city. With their free refill policy buy one latte in the first Starbucks you pass from your hotel, hang on to your cup and you will never be without a drink wherever you go within the city.